Asawa began making art while in the Japanese internment camps in 1942 and 1943. Starting in the 1950s, she developed a technique of crocheting wire into sculptures, inspired by the basketweaving she learned about while visiting Mexico. This influence led to her work being dismissed as domestic and too craft-like to be taken seriously by the art world, and she was often labeled as "decorative" - an adjective almost solely applied to female artists. But, she did live to see her work begin to be acquired by institutions like the Whitney, and celebrated for how it challenges traditional notions of sculpture. The exhibition served as a retrospective contectualizing her work within art history of the late twentieth-century. "The Japanese Internment Camps are such an overlooked part of our history, and I thought the show shed light on the reality of the camps in an interesting way. It was powerful how Asawa took such a dark and tragic experience and used it to find a way to express herself and turn to art. I appreciated how they weren't ostracizing it as 'women's work' and were recognizing it as fine art, treating it with the respect that they give shows by any other artist working in sculpture." Maya Lin's work spans from the Vietnam Memorial in Washington D.C. to environmental installations at Storm King to intimate gallery shows. In "Ebb and Flow" at Pace last fall, she used recycled materials to create installations inspired by waterways. Each piece takes a waterway like the Nile or the Arctic Ocean and scales it down to something that can be comprehended all at once. The works appear to have grown out of the gallery's walls and floors, and aimed to freeze what is always in flux. Not only does the flow of water mean that a depiction of a river will never be exactly the same twice, but on a grander scale the threat of climate change, pollution, and development means that our waterways could go so far as to disappear. "I like how Lin's work is socially conscious while also being aesthetically pleasing. The pieces in 'Ebb and Flow' were such an ingenius way of bringing attention to an immediate problem, but even if someone wasn't aware of their message they could still appreciate the experience as art for art's sake. It was interesting to look at, and you'd get invested in trying to figure out her process and materials, besides just thinking about their meaning." This exhibition brought together two bodies of work by Muholi: "Brave Beauties," a series of portraits of transwomen in South Africa, and "Somnyama Ngonyama," self-portraits exploring different characters and archetypes of black women throughout history. The striking images utilize everyday objects that are transformed into props and costumes, signifying how these portrayals bump up against contemporary life. In these photographs, Muholi bears witness to history while also disrupting the monotanous imagery of black women that proliferates media today. 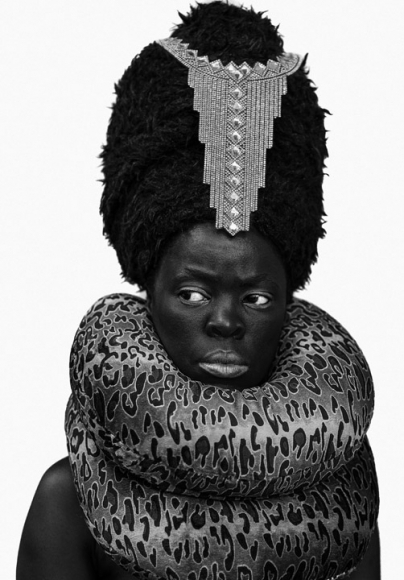 "What I loved about the Muholi exhibition is that it wasn't just highlighting the absence of women of color in the art world, but focusing on women within that demographic that are still so often left out. The LGBTQ community isn't just oppressed in Africa, but is claimed to not even exist. Her portraits of transwomen in South Africa challenge that notion that other gender identities and sexualities are 'unafrican.' This work is so controversial that her studio was broken into and her photographs were stolen to try and prevent them from being shown. Then, with her self-portraits, she's showing the beauty of darker-skinned women; she's editing and stylizing her photos to enrich and enhance these darker skintones that are typically excluded even when black women are represented at all. This woman is presented as a regal, classical beauty, but it's not trying to mimic western female portraiture. The portraits are very much ingrained in particularly African culture and the things that we find beautiful and the traditions that we cherish." Toyin Ojih Odutula's drawings of two fictional aristocratic Nigerian families feel very much of our time. The fashion and interiors could be pulled right from your favorite stylish Instagram accounts, but the technique and composition is rooted in traditional portraiture. The draftsman-like detail, gradation of luscious color, and meticulous mark-making is particularly impressive when created with pastel and charcoal. But it is the psychological atmosphere and enticing narrative that really draws the viewer in, along with the elevation of people of color as subjects beyond the narrow roles they've filled in figurative work throughout history. "We got to see Toyin speak at the Whitney with Yaa Gyasi, Texas Isaiah, and the Assistant Curator, Rujeko Hockley. As she was explaining the inspiration for this body of work, I was thinking about being a kid and wondering why I never saw representations of black families in high society, and when I went to see the exhibition it filled this childhood void. I was surprised to learn that they were drawings. I'd been following her work and was familiar with her ink drawings that mimicked paint, and had figured she was progressing to painting. The level of detail and the rich quality she was able to achieve was incredible, and I liked that the portraits felt simultaneously incredibly contemporary and traditionally African. To me, she's carving out her own cannon of portraiture." Kara Walker's show at Sikkema Jenkins caused a stir from the moment the title and artist statement were released (find them in full at the link above). The visceral exhibition featured her signature silhouettes depicting brutal, violent scenes along with similarly gutting drawings and paintings. The imagery traces the legacy of racism throughout American history, from slavery to the KKK and right through to Trump's election. The no-holds-barred rage was palpable in every piece. Jerry Saltz called it "the best art made about this country in this century." "I've long admired Kara Walker's work, and was totally pulled in by the mysterious lead-up to the show. Although the themes of her work have not changed very much, I was interested to see how far she was going with her imagery and not shying away from confrontation and this explicit approach to dealing with race relations in America in our current climate. I was glad to see her exploring that beyond her cut-outs too. I've heard reactions to her work that talk about how they're waiting to see something new from her, or accusing her of beating a dead horse. But I don't think she should let up at all." This was the first retrospective dedicated to the Cuban printmaker in the United States. Ayón created imagery rooted in Afro-Cuban folklore and spirituality using her signature technique of collography. With an austere palette and a large scale, the prints formed a narrative throughout the exhibition. The figures she depicted sometimes have a stark immediate presence while others remain shadowy and barely emerging from the backgrounds, creating an unnervingly dynamic experience as you walked through the rooms. The otherworldly nature of her work is even more haunting when seen through the light of knowing that Ayón took her own life under mysterious circumstances when she was only thirty-two. "I originally wanted to go to this exhibition because I've been exploring printmaking myself, and the opportunity to see a show dedicated to printmaking is so rare. Ayón's process is unusual, and I was interested in seeing how the technique could be used to create such detailed pieces and to build narratives. But I wasn't prepared for the emotional impact her work had on me. It was difficult to separate her explorations of the spirit world from the knowledge we now have of what her mental state must have been, and so these figures stopped being mythical representations to me and began to feel extremely intimate, like perhaps these works are more autobiographical than initially perceived. It's been months and I'm still thinking about the show all the time - those eyes, especially." Hilton Als curated a selection of Alice Neel's portraits of everyday people -- the bohemians, artists, academics, and neighbors that populated her world of uptown Manhattan. Particularly notable for her casual portrayal of a diverse array of sitters in the face of the white-washed world of figurative painting, Neel's work is celebrated for reflecting a world that a much bigger audience could recognize. These portraits are tender, compassionate, and humanist. "I wasn't alive when Neel was painting these portraits, but I still looked at them and thought 'I know all these people.' They gave me the same sense I get when looking at street photography, that they're so intimate it makes me nostalgic for a memory that isn't even mine. The portraits are simple and straightforward, yet so evocative of a particular time and place that I'm endlessly interested in. I loved the work itself - the expressionist brushstrokes, her taste in color, the way she suggested so much for the backgrounds with so little - but it was this uncanny familiarity with her subjects that left the biggest impression on me." "8 'till Late" was the Americanized debut of Lucy Sparrow's hit installation, "Cornershop," in London. The space was transformed into a cramped bodega, only everything - from the food on the shelves to the register to the cat licking its chops on the deli counter - was made entirely of felt. The level of detail was remarkable, both in terms of the likenesses to well-known products and the spot-on overall atmosphere of the beloved institution of a bodega. A back room featured slightly more traditional gallery fare, like a frame showcasing a grid of felt Warholian Campbell's soup cans. Originally slated to run for a month, the show was such a hit that it was forced to close a week early when the very last item was sold. "Was '8 'till Late' as big of an artistic achievement as the Toyin Ojih Odutula exhibition or as important as the Kara Walker show? No. But I had such a complete blast spending time in this felt bodega and, damnit, that means something too. When done well, I love a sense of humor in the art world, and it was so great being in this packed room having fun with all these Art People who were smiling and laughing and excitedly pointing out all these little details to the strangers around them. It felt like such a New York moment in such a New York show, and I think being the jumping-off point for a memorable experience like that can be just as big of a sign of success as the work itself. Plus, they had a 'quarter' machine where, for a $5 felt coin, you got a little keychain in a plastic ball, so you could easily take home some of the art, and how often do you get to do that? Mine was a slice of a hardboiled egg!" These paintings of interiors are meticulous renderings of imagined homes, pulled from memories and emotional attachments to places from throughout Suss' life. The contrast of the flatness emphasizing the feeling of looking upon a stage or a dollhouse with the abundance of personal objects and design choices signifying a very human touch creates an intriguing tension. There is an implied life that is being lived here, with all its little dramas and fraught with emotion, but the absence of any significant evidence of that life beyond the things that fill it leaves the viewer to build the narrative on their own. It amplifies the psychological aspects of the domestic, where "space becomes a metaphor for being human, ripe with mmemonic potential for intimacy, discovery, and transformation." "I've been very drawn to interiors for the past year or two - maybe because I'm always looking at interior design for my work here at the gallery, or because I'm reaching the point in my life where I want to nest but can't afford to decorate the way I want to and this is a nice fantasy outlet for that desire. I was excited to finally get a chance to see Suss' work in person not only because I love her work, but because I think she has greate taste in decor. I think what makes her stand out for me in terms of artists working with interiors is the scale. The paintings are so large that it's easy to get enveloped by the psychological atmosphere they're creating. The scenes feel fairly minimal, but they're so full of detail and little hints of a life. I was only able to take detail shots, yet I still discover things I hadn't noticed before each time I look through my photos." Tianmiao collected more than 2,000 words for women from languages around the world and eras spanning centuries, then created raised woolen forms from a selection of that vocabulary ontop of antique Chinese carpets covering the floors of the gallery. Visitors walked among the installation to have a tangible, tactile encounter with the ways language can diminish or empower women. The use of textiles reclaims these words through a medium that has, historically, been one of the few options for women to create and express themselves. "I will always enjoy a show where women are subverting the connotations surrounding textile work to create something politically charged. With "Protruding Patterns," Tianmiao struck the perfect balance between being tongue-in-cheek and effectively portraying her important message. The ways language is used in the oppression of women is something I've been thinking about since I was a teenager, but I was still taken aback by being immersed in such an extensive array of words that were so often intensely degrading. I appreciated the inclusion of positive, empowering words too. That kept it from being a little too easy. I couldn't help but try to imagine the equivalent exhibition for gendered language about men. It was...much smaller." Lots of great choices and some of my favorites included on your lists. Ruth Asawa and Ayalon Belkis were extraordinary! Terrific post! I always enjoy reading how others see / respond to exhibits. Not only have each of you added to my experience of the work of these artists, but I've also learned more about you! Thank you. Really nice article by both of you. I liked your selections, some shows I saw too, but others I missed. Your honest reactions gave insight to the work, but also yourselves, nicely said!